Today, when you order "Throw Streamers Cresey (Red)", you'll instantly be emailed a Penguin Magic gift certificate. You can spend it on anything you like at Penguin, just like cash. Just complete your order as normal, and within seconds you'll get an email with your gift certificate. Used world-wide by magicians, clowns and anyone else who wants to include a beautiful production. 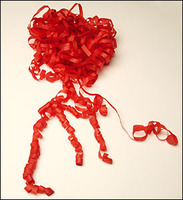 Each package contains 24 non-reusable, red streamers.